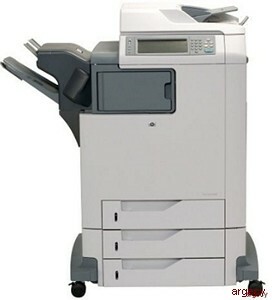 The HP Color LaserJet 4730mfp series is designed to be shared by a workgroup. Use the MFP to copy and print color and black-and-white documents or to digitally send color or black-and-white documents. 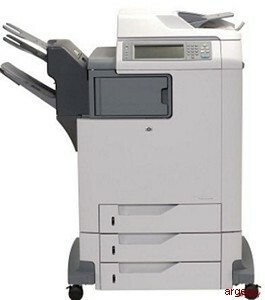 The MFP is a standalone copier that does not require connection to a computer. With the optional HP LaserJet Analog Fax Accessory 300 (included with some models), the MFP can also send and receive faxes. With the exception of digital sending and network printing, it would be possible to select all functions at the MFP control panel. It is possible to increase the capabilities of the MFP by adding optional accessories. NOTE: Use the accessories and supplies that have been specifically designed for the MFP in order to ensure optimum performance. The MFP has five ports for connecting to a computer or a network. The ports are at the left, rear corner of the MFP. Before moving the MFP, be sure to lock the scanner. The scanner lock is underneath the scanner lid, to the left of the scanner glass. To use the e-mail functionality, the MFP must be connected to an IP-based network that has a simple mail transfer protocol (SMTP) server. This server can either be on the local area network or at an outside Internet service provider (ISP). HP recommends that the MFP be located on the same local area network (LAN) as the SMTP server. If using an ISP, connect to the ISP by using a digital subscriber line (DSL) connection. If obtaining e-mail services from an ISP, ask the ISP to provide the correct SMTP address. Dial-up connections are not supported. If there is no SMTP server available on the network, third-party software is available that allows to create an SMTP server. However, purchase and support of this software is the user's responsibility. WARNING: Power requirements are based on the country/region where the MFP is sold. Do not convert operating voltages. This can damage the MFP and void the product warranty. Note1 Values subject to change. Refer to the following URL: http://www.hp.com/support/clj4730mfp for current information. Note2 Power numbers are the highest values measured using all standard voltages. 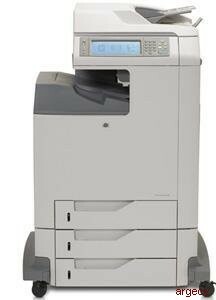 Note3HP Color LaserJet 4730mfp series printing and copying speeds are 31 ppm Letter size and 30 ppm A4 size. Note4 Heat dissipation in Ready mode = 288 BTU/hour. Note5 Default time from Ready mode to Sleep mode = 45 minutes. Note6 Recovery time from Sleep mode = less than 20 seconds. Ideally, the printing and paper storage environment should be at or near room temperature, and not too dry or too humid. Remember paper is hygroscopic; it absorbs and loses moisture rapidly. Heat works with humidity to damage paper. Heat causes the moisture in paper to evaporate, while cold causes it to condense on the sheets. Heating systems and air conditioners remove most of the humidity from a room. As paper is opened and used, it loses moisture, causing streaks and smudging. Humid weather or water coolers can cause the humidity to increase in a room. As paper is opened and used it absorbs any excess moisture, causing light print and dropouts. Also, as paper loses and gains moisture it can distort. This can cause jams. Care should be taken not to purchase more paper than can be easily used in a short time (about 3 months). Paper stored for long periods might experience heat and moisture extremes, which can cause damage. Planning is important to prevent damage to a large supply of paper. The best way to store an opened ream of paper is to rewrap it tightly in its moisture-proof wrapping. If the MFP environment is subject to extremes, unwrap only the amount of paper to be used during the day's operation to prevent unwanted moisture changes. Note1 Values subject to change. Note2 HP Color LaserJet 4730mfp series speed is 30 ppm A4 size. 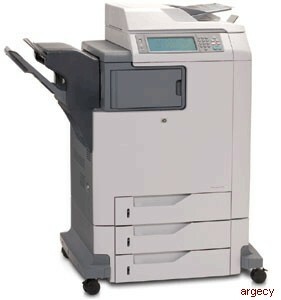 Configuration tested (HP Color LaserJet 4730mfp): Base model, simplex printing with A4 paper size. This section provides specifications for media that can be used in this MFP. Weight: The weight of the envelope paper should not exceed 105 g/m2 (28 lb) or jamming might occur. Construction: Prior to printing, envelopes should lie flat with less than 6 mm (0.25 inch) curl, and should not contain air. Condition: Envelopes should not be wrinkled, nicked, or otherwise damaged. Temperature: You should use envelopes that are compatible with the heat and pressure of the MFP. Size: You should use only envelopes within the following size ranges. NOTE: Use only tray 1 to print envelopes. You might experience some jams when using any media with a length less than 178 mm (7 inches). This might be caused by paper that has been affected by environmental conditions. For optimum performance, make sure you are storing and handling the paper correctly. Choose envelopes in the printer driver. Double side-seam construction has vertical seams at both ends of the envelope rather than diagonal seams. This style might be more likely to wrinkle. Be sure the seam extends all the way to the corner of the envelope as illustrated below. Envelopes with a peel-off adhesive strip or with more than one flap that folds over to seal must use adhesives compatible with the heat and pressure in the MFP. The extra flaps and strips might cause wrinkling, creasing, or even jams and might even damage the fuser. The following gives typical address margins for a commercial #10 or DL envelope. NOTE: For the best print quality, position margins no closer than 15 mm (0.6 inch) from the edges of the envelope. Avoid printing over the area where the envelope's seams meet. CAUTION: To avoid damaging the MFP, use only labels recommended for laser printers. Never print on the same sheet of labels more than once or print on a partial sheet of labels. Adhesives: The adhesive material should be stable at 200C (392F), the MFP's fusing temperature. Arrangement: Only use labels with no exposed backing between them. Labels can peel off sheets with spaces between the labels, causing serious jams. Curl: Prior to printing, labels must lie flat with no more than 13 mm (0.5 inch) of curl in any direction. NOTE: Choose labels in the printer driver. Transparencies used in the MFP must be able to withstand 200C (392F), the MFP's fusing temperature. CAUTION: To avoid damaging the MFP, use only transparencies recommended for use in HP LaserJet printers, such as HP-brand transparencies. NOTE: Choose transparencies in the printer driver. For optimum results, use conventional 75 g/m2 (20 lb) photocopy paper. Verify that the paper is of good quality and is free of cuts, nicks, tears, spots, loose particles, dust, wrinkles, curls, or bent edges. NOTE: Test any media, particularly custom media, before purchasing large quantities to ensure that it will perform satisfactorily. NOTE: Do not use inkjet papers in this MFP. Note1 Trays 2, 3, and 4 use custom sizes specifically for B5 ISO. These trays do not support the range of custom sizes that can be used in Tray 1. For the stacker on the stapler/stacker or the lower bin on the 3-bin mailbox: 500 sheets of 75 g/m2 (20 lb) paper. For the top two bins on the 3-bin mailbox: each can hold 100 sheets of 75 g/m2 (20 lb) paper. Note1 The MFP supports a wide range of sizes. Check the MFP software for supported sizes. Note2 Capacity can vary depending on paper weight and thickness, as well as environmental conditions. For plain media: 30 sheets of 75 g/m2 (20 lb) paper. This equipment has been tested and found to comply with the limits for a Class A digital device, pursuant to Part 15 of the FCC Rules. These limits are designed to provide reasonable protection against harmful interference when the equipment is operated in a commercial environment. This equipment generates, uses and can radiate radio frequency energy and, if not installed and used in accordance with the instruction manual, may cause harmful interference to radio communications. Operation of this equipment in a residential area is likely to cause harmful interference, in which case the user will be required to correct the interference at his own expense. The end user of this product should be aware that any changes or modifications made to this equipment without the approval of Hewlett-Packard could result in the product not meeting the Class A limits, in which case the FCC could void the user's authority to operate the equipment. NOTE: Any changes or modifications to the printer that are not expressly approved by HP could void the user-�s authority to operate this equipment. This product is intended to be connected to the analog Public Switched Telecommunication Networks (PSTN) of European Economic Area (EEA) countries/regions. It meets requirements of EU R Directive 1999/5/EC (Annex II) and carries appropriate CE conformity marking. However due to differences between individual national PSTNs the product may not guarantee unconditional assurance of successful operation on every PSTN termination point. Network compatibility depends on the correct setting being selected by the customer in preparation of its connection to the PSTN. Please follow the instructions provided in the user manual. If you experience network compatibility issues, please contact your equipment supplier or Hewlett-Packard help desk in the country/region of operation. Connecting to a PSTN termination point may be the subject of additional requirements set out by the local PSTN operator. Hewlett-Packard Company is committed to providing quality products in an environmentally sound manner. This product has been designed with several attributes to minimize impacts on our environment. This product generates no appreciable ozone gas (O3 ). This product qualifies for ENERGY STAR� , a voluntary program established by the U.S. Environmental Protection Agency (EPA) to encourage the development of energy-efficient office products. ENERGY STAR� is a U.S. registered service mark of the U.S. EPA. As an ENERGY STAR� partner, HP has determined that this product meets ENERGY STAR� guidelines for energy efficiency. This product's automatic duplex feature (two-sided printing) and n-up printing (multiple pages printed on one page) capabilities can reduce media usage and the resulting demands on natural resources. Plastic parts over 25 grams are marked according to international standards that enhance the ability to identify plastics for recycling purposes at the end of the product's life. It-�s easy to return and recycle your empty HP LaserJet print cartridges-�free of charge-�with HP Planet Partners. HP is committed to providing inventive, high-quality products and services that are environmentally sound, from product design and manufacturing to distribution, operation and recycling processes. We ensure your returned HP LaserJet print cartridges are recycled properly, processing them to recover valuable plastics and metals for new products and diverting millions of tons of waste from landfills. Since this cartridge is being recycled and used in new materials, it will not be returned to you. Your empty HP LaserJet print cartridges are recycled responsibly when you participate in the HP Planet Partners program. Thank you for being environmentally responsible! In many countries/regions, this product-�s printing supplies (print cartridges, fuser, and transfer unit) can be returned to HP through the HP Printing Supplies Returns and Recycling Program. An easy-touse and free takeback program is available in over 35 countries/regions. Multilingual program information and instructions are included in every new HP LaserJet print cartridge and supplies package. Use the label to return empty, original HP LaserJet print cartridges only. Please do not use this label for, non-HP cartridges, refilled or remanufactured cartridges or warranty returns. Printing supplies or other objects inadvertently sent to the HP Planet Partners program cannot be returned. More than 10 million HP LaserJet print cartridges were recycled globally in 2004 through the HP Planet Partners supplies recycling program. This record number represents 26 million pounds of print cartridge materials diverted from landfills. Worldwide, in 2004, HP recycled an average of 59% of the print cartridge by weight consisting primarily of plastic and metals. Plastics and metals are used to make new products such as HP products, plastic trays and spools. The remaining materials are disposed of in an environmentally responsible manner. For a more environmentally responsible return of used cartridges and supplies, HP encourages the use of bulk returns. Simply bundle two or more cartridges together and use the single, pre-paid, and pre-addressed UPS label that is supplied in the package. This product is capable of using recycled papers according to EN 12281:2002. HP recommends the use of recycled papers that contain not more than 5% ground wood, such as HP Office Recycled paper. This HP product contains mercury in the fluorescent lamp of the control panel liquid crystal display that might require special handling at end-of-life. The product herewith complies with the requirements of the EMC Directive 89/336/EEC and the Low Voltage Directive 73/23/EEC, the R&TTE Directive 1999/5/EC (Annex II) and carries the CE-Marking accordingly. The product was tested in a typical configuration with Hewlett-Packard Personal Computer Systems. Compliance testing of product to standard with exception of Clause 9.5, which is not yet in effect. For regulatory purposes, this product is assigned a Regulatory model number (BOISB-0503-00). This number should not be confused with the product name or the product number(s). All worldwide modular approvals for analog fax accessory obtained by Hewlett-Packard under the regulatory model number BOISB-0308-00 incorporate the Multi-Tech Systems MT5634SMI Socket Modem Module.